How to get a free classifieds site? How to promote a classifieds website for free? Why Is Responsive Web Design So Important? What is Yclas Self Hosted? Where to Find Your License Number? I bought the hosting plan, how do I get my discount? Why is my license not working? Modify or Create a Theme? How to fix the Base URL? I accidentally changed my admin privilege, how can I fix that? How to fix classifieds listings page issue? If you want users to see a customized thanks page after they publish their ads, you can use this feature. 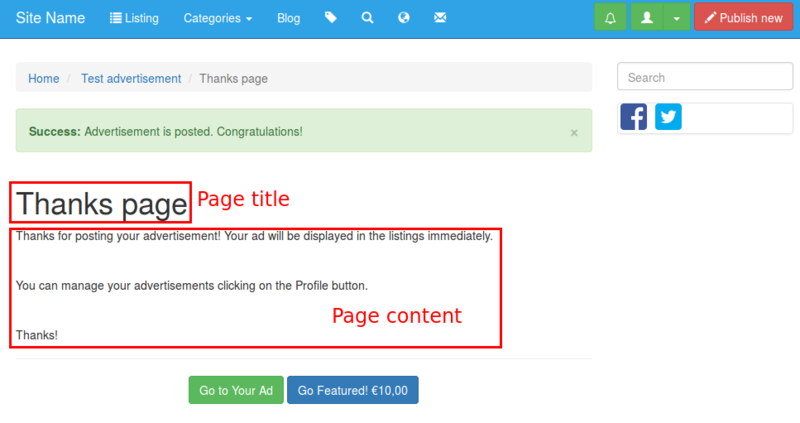 First, you need to create a new page and then to choose this page as the content that will be displayed to the user after he publishes an ad. Create a new page and add the content that will be displayed to the user. Go to Settings -> Advertisement -> Publish Options -> Thanks page and select the page you have created.